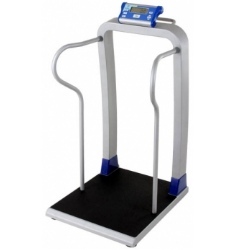 Accuracy, patient safety, and portability have all been engineered into the Doran DS7100 Handrail Scale. Moving the scale from room to room takes very little effort, as the scale only weighs 30 pounds. Simply tilt the scale back on the two built-in, non-marking wheels and roll the scale to its new destination. Accuracy, patient safety, and portability have all been engineered into the Doran Medical DS7100 Handrail Scale. Moving the scale from room to room takes very little effort, as the scale only weighs 30 pounds. Simply tilt the scale back on the two built-in, non-marking wheels and roll the scale to its new destination. The non-skid surface on the large low-profile base and the ergonomically designed handrails have been designed with the safety of unsteady patients in mind.